Girls I'm so excited! These tests are just for PRACTICE. They're just to give us an idea of what to expect when we take instructor or NCLEX exams. I found the fourth module particularly helpful. As for the tests, highest grade I got was a 70% and that was on the first one. The rest were 50's and a 40. I'm not worried. See you all tomorrow!!! :) Hey, as for printing, I couldn't get them to print out. I thought I saved them to my flashdrive and went to another computer to print them but my computer wouldn't let me pull them up. Do you think if we get there early tomorrow, we could use their printers? Just wondering. Hey YYKS, I'm just printing whatever came up. I had such a hard time with these! I got a 70 on first one, 50 on second and third and a 40 on the fourth one!!! Instead of getting better I got WORSE! haha. I hope this was just to give us a feel for test taking. I could have taken longer and looked up answers but I didn't really have the time. Life has been crazzzzy!! See you tomorrow! Hi Celeste! You're a RIOT! But I agree....I thought all the hustle and bustle was done! -I've ordered uniforms...they're backordered -cannot buy books until school starts only have fundamentals books -Did two nurse logic - got 70% on first, 50% on second YIKES!!!! WHY are we being asked things we didn't learn yet??? -TRIED to get PSU id before christmas. Machine was broken. I'm going on Tuesday morning before classes begin. -Have to download cpr card. I KEEP FORGETTING!!! I'll be so happy once we "settle in" to classes. C U soon! Hey wontgiveup! 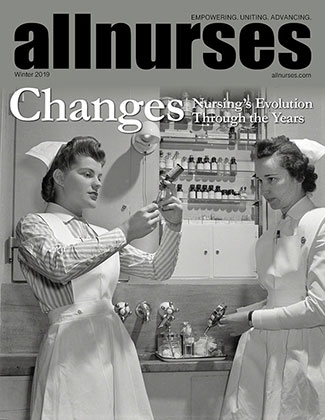 What the heck happened to allnurses?? I've been freaking out over these modules we have to do before Tuesday! I have NO IDEA what the deal is. I've completed two of them. I got a 70% on the first one and a 50% on the second one, which I think was critical thinking but I'm not sure at the moment. I'm just doing them and handing them in regardless of the grade. You're right...we do not know this information yet. I'm not sure why we are expected to do them, but I'm doing them. HAHAHA See you Tuesday! Did you get your penn state ID? I tried before christmas but got an email their machine was down. Hi everybody. I checked out the Nurse Logic assignments. Viewed the first one last night but it was like 1:00am so I didn't answer the questions. Doesn't seem really easy, but probably not too hard either. I was TIRED. I'll try again in next day or so. Let me know what you all think. Also received a message from Susan Costello today about course documents. Remember when she asked us how many would like a reading list in advance. Well, I think this is it. However, I followed instructions, went on home page of Aria sonis under student, put in my code and password and clicked bio. It came up with all of my credits that transferred. They transferred 36 of my credits!!!! I was VERY happy. :monkeydance: BUT...when I scrolled down to click on nursing 110 like she instructs us to do, I cannot seem to get any list to pull up. Can anyone help??? I'd like to start reading if possible in the next few days. Thanks gals!!! Oh, and for those of you who've followed my sage with my grand daughter, etc. etc., I FINALLY have childcare. Just pray I can get her there and be at clinicals by 7 am!!!!!!!!!!! I'm no young chicken. LOL Thanks. Hi Katie WELCOME!!! make sure you check out the new forum Celeste started. Scroll back a page or two and you'll see the link. Take care! There's Kate (braided blonde hair), Katie and Kaitlin (but I get these two mixed up - SOOOO sorry!!!!!). Hey Bonnie90- If you're going to have the itouch or compatible device you'll have the Davis Drug guide, Davis' Laboratory and Diagnostic Tests and Tabers Medical Dictionary - so that'll be 3 books you don't have to purchase. Then, according to my advisor, of the items listed on page 3 of the Library orientation packet Nursing Book List/Winter 2012 - of the required items we need them all but she said we ESPECIALLY need Hogan, M.A. Prentice hall's comprehensive review for NCLEX and Nugent, P.M> Test success: test taking..... (this is the book they mentioned during orientation). Of course, we need Wilkinson's Fundamentals of nursing. She also said we should get the Doenges, M.E. Nursing diagnosis manual. (This book is available on EBSCOHOST hospital intranet electronically, again if you'll be using some sort of smart phone or ipod touch). The Med Math and Brunner * Suddarths Medical/Surgical Nursing is needed for 111. The ANA books on front of page 3 are required but my advisor didn't STRESS those too much. Hope this helps some. Again, I'm going from the handout Sophia the librarian gave us. First page (of 3) heading is Aria Health School of Nursing Library Orientation. Hi everybody. Just ordered my uniforms. UGH! sooo expensive! But oh well, gotta do what we gotta do. Well, I'll be buying books here and there until I have everything. My advisor told me which books were a necessity in Nsg. 110, so I'll focus on them first. Then work my way through the list. Hey wontgiveup - glad we have the same advisor! :) @Jess and @bonnie wow, I don't like that you know me but I don't know you girls - jk...anyway, just introduce yourselves in january. :) @awarren, I am so sorry to hear of your difficulties. But remember, there is a reason for everything that happens...it will work out in the end. See you in September. Make sure you introduce yourself to all of us when you come ok?? Have a nice Christmas everyone. See you soon. and, oh...DON"T forget to do the Nursing Logic Assignment. "celeste" thanks for making this site!!! Hello Ladies!! Well, Orientation is over...do we feel, well, "oriented" haha So glad to meet ALMOST everyone. Where are you Bonnie, awarren and Jess 02??? Speak up we need to know who you are!